The graphic below shows the national average locksmith charges. 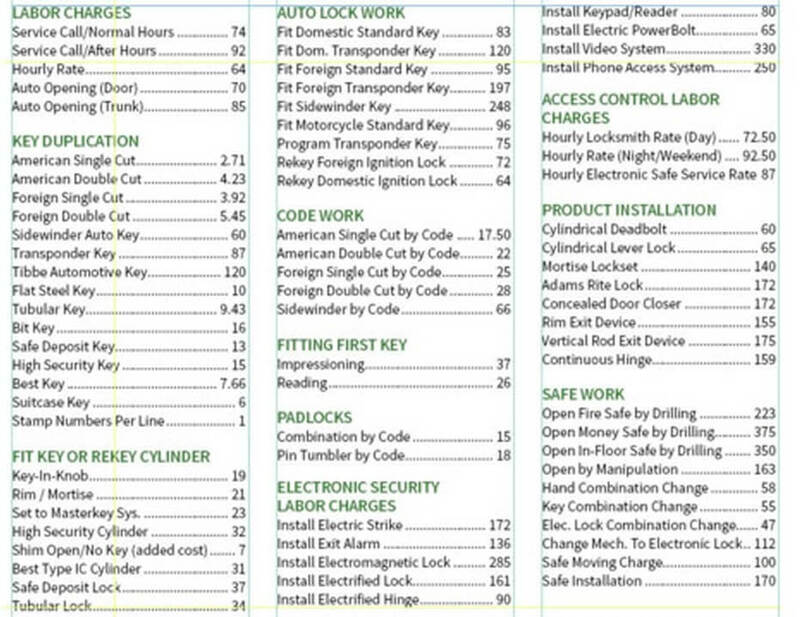 These averages represent charges actually reported by hundreds of locksmith companies all around the US. Depending on your locations, rates can be expected to vary slightly. Why Did the Locksmith Charge So Much? It’s a buyer beware situation. ACME Locksmith has spent considerable resources education the public on locksmith fraud, and one thing is always certain. You will get the best price, when you are quoted an exact price upfront. No exceptions. 2) All of their quotes will be withing a few dollars of each other. Going with anyone that cannot tell you exactly what it costs to open you car, open your house, or rekey you locks WILL cost you more money when they arrive. Don’t be tempted by the cheap service call “plus labor” quotes that illegitimate locksmith companies use to land your job. It will cost you money. There is no such thing as a $19-$39 locksmith service. It’s a scam. All legitimate locksmith companies use average-based job pricing. We charge based on the service we are hired to perform. It doesn’t matter how long it takes us, legitimate locksmiths charge and quote flat rates. We understand the average length of any given job and the average time it takes us to to service a call, so we charge based on those averages, regardless of how long it actually takes to do a specific job or get to a specific job. Because we never know upfront how long it will take to get to a call and how long it will take to perform the services we have quoted. So we rely on averages so we can quote one specific price for one specific service. For example. Or locksmiths can unlock some cars in a few moments, but some turn out to be difficult and can take much longer. We charge a flat rate for any car unlock service regardless of if we are in quickly or struggling to open the car. Sometimes the job we need to do is right down the street, sometimes it’s twenty miles away. We never know ahead of time where our drivers will be when a call comes in, so we charge the same flat rate for everyone. For the customer’s car we struggle opening, the customer sees us working hard, in the AZ 110 degree heat, sweat pouring off our forehead. This customer is always extremely happy they got such a great deal on the price. However, it’s the exact same locksmith service performed. Only the perception of the service has changed. We were hired to unlock a car, we unlocked the car. And it’s at the same, agreed-to price, regardless of how long it takes us to get there or perform the work. You are paying for an exchange of service, not the length of time to complete that service. We perform that service at that price, every time. Sometimes we come out ahead (i.e. we get it done fast) and some times we don’t, but it’s unethical for us to charge the person whose car takes us longer to get into more than we quoted them. We also don’t want to quote every call for the worse case scenario. So we average it out. Additionally, there are so many locks, keys, and hardware brands out there that every job ends up being different. This makes jobs hard to quote site unseen, over the phone because we simply don’t know what we will run into. But, we are asked to do this every time a customer calls. IMPORTANT: Locksmith fraud is a totally different beast. Scam locksmith companies rip people off by charging many hundreds of dollars for services that should be under or around $100. Those scammers should be thrown out of all states. Information on locksmith fraud is covered in great detail here. Usually this comment includes something like “It only took you 10 minutes to do the job,” or “But your shop is right down the street.” If a locksmith unlocks you car in 5 minutes and for $100 does that mean you were charged $1,200 / hour. Let’s consider each of these separately. Yes, the locksmith may have completed the work quickly, but you are hiring a locksmith to perform a service. You are not hiring the locksmith for their time as you would a therapist for example. When ACME gets you into your home quickly, most customers are very grateful, but a few fixate on the amount of time it took to open the door. After all, watching the locksmith get in is the only part of the job the customer sees. What you are not seeing is the effort it has taken the locksmith to get ready for your call. They didn’t see us drive across town to get there. They didn’t see the fuel that was used, or the insurance that was spent, or the salary that was paid. They didn’t see the countless hours spent every year training and certifying our team on the latest tools and techniques — specifically so we can get you in as fast as possible. That’s what the charge to unlock a home or car is for. It’s not for the few minutes it takes to open the door, it’s payment in exchange for a service that we’ve made considerable investment in so that our locksmiths can solve your problem as fast as possible. ACME Locksmith sends you the very best, certified, locksmith we have available to take care of you as soon as we can, as fast as we can. That’s how we roll. We recently heard this objection from a home owner. They had locked themselves out of their house on a Tuesday afternoon. It took us about 30 minutes for our technician to arrive onsite, but they were in the house very quickly. The customer ran the calculation in their head for just the time after we had arrived and felt our hourly price was insane! They called ACME Locksmith to speak to the owner, me, directly. So I knew we hadn’t made a misstep in the quote. It’s an interesting phenomenon in the locksmith trade. It takes incredible skill and training to get to the point where we can perform services quickly, but the better we get, the less our skills are appreciated. This is often true. However, locksmiths cannot send the person working in their shop out to you. Those locksmiths are busy servicing customers that come into our stores. We send our field locksmiths to service field calls. The drive time it takes a field service technician to get to you depends on where all the other calls we book for that day are located. Unless it is an emergency lock service and we are dispatching someone immediately, we don’t know ahead of time how long it will take to get to any given job. So we average it out and charge a flat rate. One thing is always true, a customer should NEVER pay more than any locksmith quoted for common services (such as lockouts, rekeying locks, and trip charges). There are a variety of things that can make a job take longer, just as there are a variety of things that can make a job go quicker for all types of lock service. So how can we quote the charge up front when every job, and every drive to every lock job, is unique? The answer is average-based pricing. So if it only took a few seconds to unlock your home or car did you pay $1200 / hour? No, you paid for the service of unlocking your house and if you’re lucky you got a good locksmith that made your day a bit easier by taking care of your job quickly. So What Is the Best Questions to Ask a Locksmith When They Get Into Your Home, Car or Business so Quickly? That’s a great question and one we can certainly help you with. Check out our favorite home deadbolts for our recommendations on product or our 7 Cheap and Effective Home Security Tips to improve you home’s security. Last notes on locksmith prices. It’s the same for automotive key programming, one flat rate for all vehicles. And for home rekeying, one quote for every home with standard residential hardware. This last point is what prompted this article. There is a small subset of residential hardware that can be rekeyed very quick under the right circumstances. REALLY quickly. Under the wrong set of circumstance this same set of residential hardware is a nightmare to rekey. We quote one price for the rekey service, and we stay at that price no matter what we run into. It’s ethical of us to stick to our price when it’s difficult, it benefits you, and it’s also fair of us to stick to the price when it’s quick, because we are performing the service hired to do for the price agreed to by the customer – to rekey their lock. Our goal is to keep out locksmith charges as affordable as possible. We remain well under the national average for nearly every locksmith service we perform. And we also want to make enough money to stay in business and feed the families of our employees. Those are our goals. Average-based pricing allows us to quote customer quickly and simply, stick to the price no matter what the job, and provide a good value on the whole. We appreciate your understanding.